Big Cypress National Preserve by Richard J Auger. August 2011. A thunderstorm looms overhead. TMAX 100, Mamiya 7ii, 43mm. B+W Orange Filter. After visiting Sanibel Island in Captiva and Lover’s Key in Estero, Florida, I drove down the Tamiami trail for a day trip to visit the Everglades, namely the Fakahatchee Strand Preserve and the Big Cypress National Preserve. My goal here was scope out the area for a kayak trip I’m planning in January, but I did take a few nice photographs during a passing thunderstorm. The drive itself was beautiful and isolated. While the best view of the parks are in the swamp walks, the mosquitos made that impossible for this trip. At Collier Seminole State Park, I stayed for about 15 minutes and left; it was August, and Mosquito season was at its peak, and this was the worst spot of the day. I could see a cloud of mosquitos floating around me, waiting to bite when the smell of my repellent wore off. I ran back out of the trail and got out of there. After taking the time this year to understand all of the Florida ecosystems, I’ve learned that you must know everything about an area to shoot it properly, such as water levels and animal breading seasons. Without proper knowledge and respect for the ecosystems, you’ll leave with few pictures and alot of bites or injury. Next, I had a more pleasant visit at the Fakahatchee Strand Preserve State Park. The mosquitos were still aggressive, but far less brutal and in fewer numbers. I took a stroll down the Royal Palm Hammock trail, and took some nice pictures along the boardwalk. There were many educational signs along the way. I’ll be back to Fakahatchee in the winter when I can take photos that do the park more justice. For the last day of my trip, I came across one of the highlights of my trip, the Big Cypress National Preserve. Located north of the Everglades National Forest, Big Cypress is a 727,000 acre freshwater estuary in South Florida, and plays an important role in supporting the health of the Everglades. With waters flowing to the ocean, Big Cypress supportstropic marine life, as well as a huge diversity of plants, trees, and birds. At least 9 endangered species thrive in the preserve. Earlier in the summer of 2011, I saw Dead Lakes State preserve, which had many glorious cypress trees in the water. Many theories exist for the need for the little ‘cypress knees’ around the tree; which may either help the tree breathe when swamps are flooded, or could proved support on the unstable swamp floor. Next winter, I’ll hike through the swamps and photograph the cypress trees. Big Cypress National Preserve Panoramic by Richard J Auger. Below, I’m waiting for the clouds to move along the roadside of the Tamiami Trail in the Big Cypress National Preserve. Richard Auger photographing the Big Cypress National Preserve along the Tamiami Trail. August 2011. This little sign says it all. Fakahatchee Strand Mosquito Sign. I was warned! Fokahatchee Strand Preserve, Florida. Royal Palm Hammock walkway. The trail was beautiful, but I had to turn around as the mosquitos began their attack. Kodak TMAX 100. I returned to Fort Myers, where I was staying that weekend, and took a few shots using 120 TMAX film on the beach. After about 4 days, I came home with alot of new photos, which have had a great reception by art collectors and nature lovers. I can’t wait to come back in the winter for some awesome hiking and kayaking. 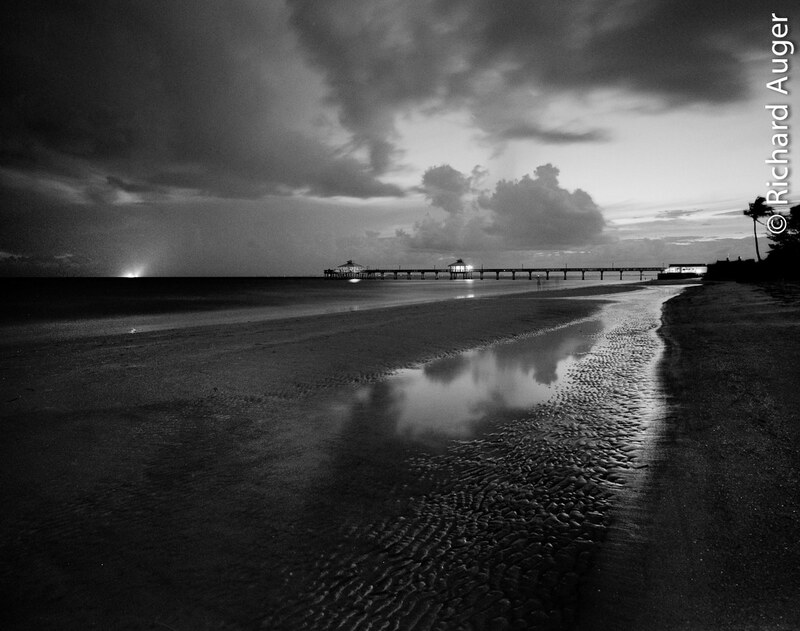 Fort Myers Beach at Night by Richard Auger. I finished off my roll of TMAX 100 before returning home. Cool stuff, more behind the scenes photos! Thanks Zach! I’ve been getting better at taking some behind the scenes photos with a point-and-shoot, will do more in the future! lol yeah I try to remember to take things like that (lighting setup shots and such) but it’s hard when you’re caught up in the moment :). Makes for good blog material though!